Since 2005 New York-based designer Oscar de la Renta has included ikat fabrics in collections ranging from clothing and accessories to furniture fabrics. "They are so unbelievably rich in color," he said. "Ikat is a very traditional fabric that works well for all seasons". Collaborating with Rasuljon Mirzaakhmedov, master craftsman from Margilan, in the Ferghana Valley, his collection includes adras (cotton and silk ikat), baghmal (silk velvet ikat) and atlas ikat (satin ikat) in bright, graphic patterns. Mr. Mirzaakhmedov's family is at the vanguard in a revival of velvet ikat weaving in which white silk threads are dyed and placed on a narrow loom, a technique that is highly complicated and practiced by very few. The process requires a month to produce just a few metres of fabric. Ikat refers to both the type of fabric and the resist-dye technique used to create the cloth. To make ikat, parts of the warp (the yarns which run vertically) or the weft (horizontal) yarns are bound and placed in a series of dye baths. The parts of the yarns that are tied and protected resist the dye, allowing makers to produce multi-colored textiles through exposing the yarn to multiple dye baths. Unlike carpets or tapestries, the design of an ikat is articulated on the yarns before weaving begins. 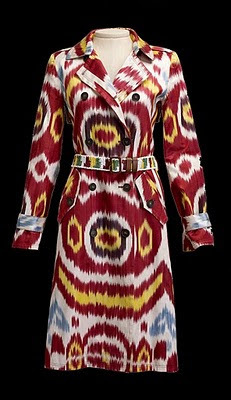 Many other designers have jumped on the ikat train, including Dries Van Noten and Gucci. Although Uzbek Journeys accompanied tours do not visit the Ferghana Valley, you certainly will see silk ikat weaving and have the chance to purchase fabulous fabrics, including silk velvet ikat, in Samarkand and Bukhara. Excursions from Tashkent to the silk centres of the Ferghana Valley can be arranged pre- or post-tour. View the range of Ferghana Valley tours. 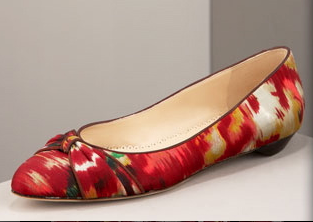 In the clip below [1.22 mins} you can view some of Oscar de la Renta's gorgeous ikat pieces.